This reacher has a number of features that make it one of the most popular reachers available. 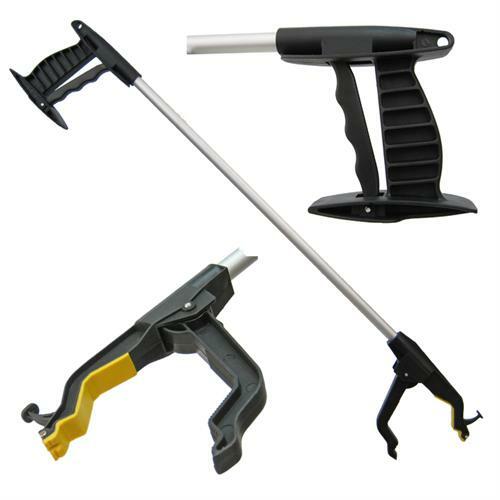 It offers a large handle with an even pull 4-finger trigger for comfort and power. The jaws are serrated on one side and covered with an high friction coating on the other for secure grasp on many different objects. These jaws actually swivel 90 degrees for easier maneuvering in narrow spaces without twisting your wrist. There is a small magnet for picking up things like staples, paperclips, and key rings. And finally, there is capped pull lug for pushing and pulling socks and other clothing. All these benefits in one economic reacher makes the HandyMate one our favorites. Special yellow high friction coating an opposing serrated jaws allow for positive grasp on objects. 30" long and weighs 7.0 ounces. Home use reacher with unique easy four finger trigger can also be operated with heel of other hand. 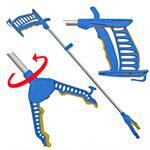 Swivel pick up fingers with pull lug and magnet. 32 inches long.